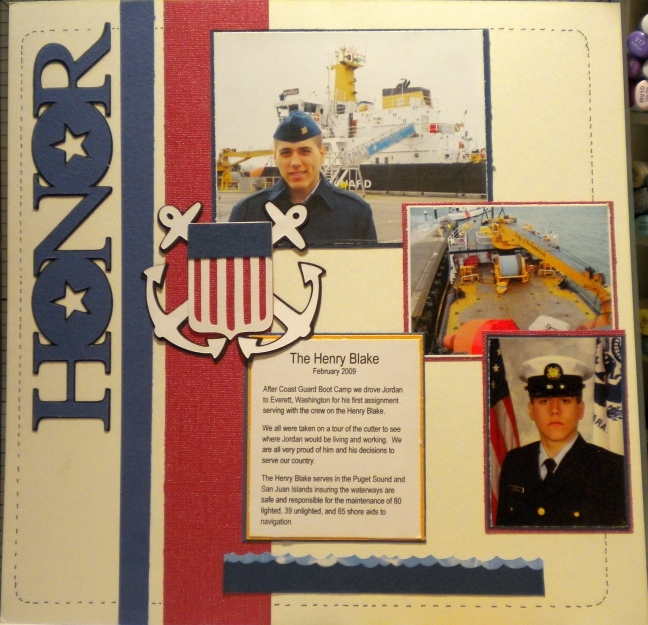 I thought I would share a scrapbook page I made this morning in honor of Veteran's Day and also my son, Jordan who is currently serving in the Coast Guard. I used the pagemaps sketch as given for the challenge going on at Paper Patch Crafts now through the 11th. This page was a definite labor of love. The challenge was to use the basic red, white and blue colors and other than a little touch of gold behind the journaling, I decided to stick with that because I liked the look of the clean and formal feel of the page. 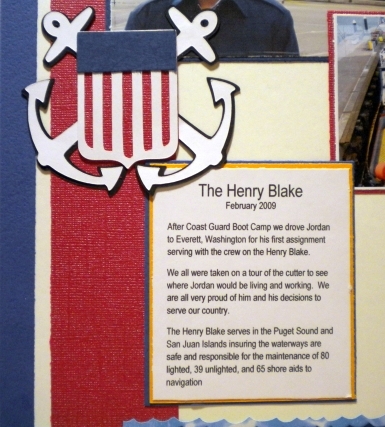 Using the Stand and Salute Cricut cartridge I built the Coast Guard Emblem (anyway a broken-down version of it) mixing some different cuts together. Instead of using another background paper as demonstrated in the sketch, I instead drew small hash-marks to frame the page and pull it all together. This turned out great! I did the same sketch, but the challenge is for Paper Secrets. I love this sketch and your turned out amazing! TFS. This is awesome! Your son will love it! This is a great Veteran's day tribute! this turned out lovely! Thanks for joining this weeks Wacky Wednesday Challenge at More Than Favors. – A new Veterans’ Day-themed episode is available on kids’ virtual field trip Web site Meet Me At The Corner (MeetMeAtTheCorner.org). Meet Me At The Corner combines the content that educators and parents trust with the high-tech delivery method today’s kids embrace. The episode starts with a visit to Colorado Springs’s Memorial Park led by Hannah, a 8-year-old Meet Me At The Corner correspondent. Hannah then interviews World War II veteran, Robert Williams. Williams shares with viewers the various jobs he held in the military, the significance of VE Day and VJ Day, and what it takes to be a good soldier. To help expand on the content, MeetMeAtTheCorner.org’s “Learning Corner” provides parents and teachers with a variety of episode-specific resources, activities and guided questions that meet national- and state-based educational standards. Our hope is that this episode initiates conversations about the true meaning of Veterans’ Day,” says Donna Guthrie, award-winning children’s author and founder of Meet Me At The Corner. Such a beautiful layout!!! Just love it. Happy veterans Day and hats off to Jordan! This layout is beautiful!